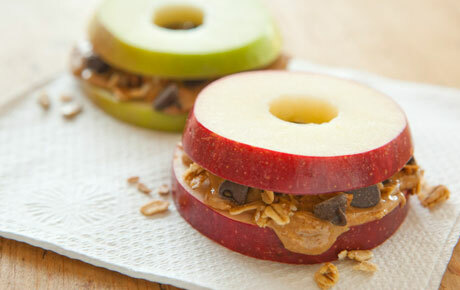 The kids are back to school, and preparing healthy snacks for after school is essential to their well-being. School lunch can be as early as 10 a.m. or as late as 1 p.m. Depending on your child’s lunch time, he or she could be starving by the time school’s out. For children with after-school activities, this scenario could leave them at the mercy of vending machines. The key here is to maximize nutrition and offer green-light foods to hold them over until the family gets together for dinner. We all know how important fruits and vegetables are – keep them washed and available. Instead of having cookies and chips at children’s fingertips, choose fruits that will retain quality even out of the refrigerator, like grapes, cherry tomatoes, small pears and apples, bananas, and oranges. Even pre-packaged fruit bowls are a good idea. Make a high-energy trail mix. Trail mix will maintain its freshness even with changes in temperature. Remember, you want to maximize nutrition, especially if you have an active child. Granola, nuts and dried fruit will certainly do that. It’s ok to add a few chocolate pieces that will give this healthy treat the cool edge children are looking for. Small snack bags are the perfect size for trail mix. And can’t do nuts? No problem; sunflower seeds and soy nuts are a great protein alternative! Make-ahead snacks. Pizza English muffins are a classic but a favorite. Make a bunch of these over the weekend, wrap in aluminum foil and freeze. Older children can simply pop these in the toaster oven for a snack that requires very little effort. If they insist on potato chips … switch to light or low-fat popcorn. Popcorn is actually a whole grain and an excellent alternative to fat-filled chips. Make a fun cheese snack. String cheese is another wholesome snack that provides protein, as well as vitamins and minerals, which are important to a growing child. Add a small tortilla and wrap up your string cheese for an easy snack.